The congressional committee on public pensions reform has agreed in principle an all-party accord to modify the formula for calculating public retirement benefits, returning to the pre-2013 practice of indexing annual increases in benefits to Spain’s IPC consumer price index. While the details governing the new formula are yet to be worked out, Wednesday’s announcement by the congressional Pacto de Toledo committee is in line with the demands of public pensioners. 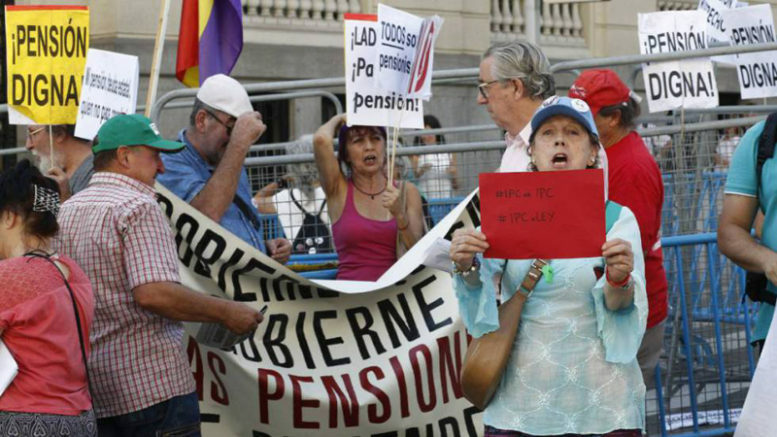 In recent months, pensioners have been vociferously protesting across Spain over the diminishing purchasing power of monthly retirement benefits, on the wane since 2013 when the former conservative Partido Popular (PP) government of President Marian Rajoy used its absolute majority in Congress to unilaterally ditch the IPC indexing. Last week, Socialist party (PSOE) Labour Minister Magdalena Valerio warned the congressional committee to move beyond a bypass and come up with a solution that would include IPC indexing in order to raise the purchasing power of retiree benefits. Public pensions in Spain have been particularly hard-hit since the 2008 onset of the country’s economic crisis, with elderly retirees hampered in their ability to contribute to the maintenance of other family members, either unemployed or under-employed as a result of the crisis. The 1995 reform of Spain’s public pensions system, referred to widely as the Pacto de Toledo, saw all Spanish political parties and labour unions agree to a broad overhaul of the system and institution of a formula of worker and employer contributions aimed to guarantee the system’s existence for future generations. In 2011, further reform by the Socialist government of then-President José Luis Rodríguez Zapatero linked the retirement benefits paid out to pensioners in Spain to the annual cost-of-living hike estimated by the real rise in the IPC consumer price index. The successive PP government of Mariano Rajoy jettisoned that reform in 2013, however, citing the need to cut government spending as its reason for doing so.